An easy, tasty yellow cake is essential to any home baker’s repertoire. An easy, tasty yellow cake with fruitis even better. My grandmother often made an amazing fruit cake – usually with plums – when we visited. This is the best kind of family recipe: there’s nothing really revolutionary, no proprietary secrets or weird ingredients – just a really, really good classic recipe that floored people every time my grandmother brought it out, and has done the same whenever I’ve made it. This recipe is the kind that I hope to rediscover every time I try something new out of one of my old cookbooks. 3. Cream the butter and sugar, then add the eggs and vanilla and mix until smooth. 4. Add the flour and baking powder mixture and blend well. The batter will be pretty thick. 5. Spread it into a buttered or sprayed pan (8×8 works, as does a 9″ pie plate). The batter will probably be spread pretty thin, but don’t worry – it rises a lot. 6. Press fruit into the batter, leaving about a 1/2 an inch between pieces, and sprinkle the top of the cake with cinnamon sugar. 7. Bake 35 – 40 minutes, until a toothpick comes out clean. Be warned – if you use especially juicy fruit (like plums), the cake might remain pretty moist in the center. In that case, just try to gauge whether you’re pulling out more juice or batter on the toothpick, and watch the edges of your cake for over-browning. 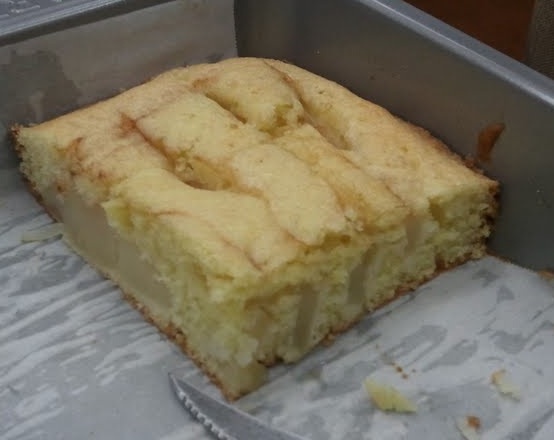 **The cake pictured above is a double recipe, baked in a 9″x13″ pan. I used 2 pears, and I mixed 1/4 c. chopped candied ginger into the batter before putting it in the pan. Coming from a fruit cake culture – the kind you use as weapons – this is a refreshing change! Actually I am a cake fanatic so even those leaden confections hold an affectionate place in my memory. Since grandma is my mother-in-law, I feel duty-bound to give the recipe a whirl. ratings from me take the form of munch marks – the more the better. Calibration is key here….